Whether you train Muay Thai, boxing, MMA or any other combat sport, you will need a good quality gym bag to carry your gear. The main qualities you need in a gym bag are; a decent size to fit all of your gear in, plenty of compartments to organise it all, strong materials, and good stitching. This buyers guide will run you through some of the best Muay Thai gym bags available from some leading brands. I will also talk about some of the features you should be looking for to get the most suitable bag for your training. Here are my top gym bag recommendations and reviews. I’ve rated them based on the features I find most important in a gym bag – you can read more about why these features are so important further down the page. Under Armour are known for good quality gear, and their gym bags certainly match up – well-made sizeable bags that you can fit lots of gear into, at mid-level prices. Nike have been making gym bags for a very long time and certainly know what they are doing. Lots of compartments, very durable, but strangely they don’t add a solid bottom lining to them. These bags come in a range of sizes and colours. Not a particularly well known brand, but their bags have all the same features as the big names and cost a little bit less. RDX are a British MMA brand so they design their bags with combat sports in mind. 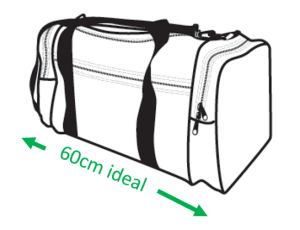 Size The length of this bag is a little on the small side at 58 cm which can make shin guards a squeeze at times. It is taller than most bags at 29cm though. Venum are another MMA brand so their gym bags are designed to carry combat sports gear. They are very well made and tough with lots of compartments. Personally, I would always recommend buying a big gym bag for Muay Thai training, due to the amount of gear you have to take with you. However, if you don’t need to take a lot of gear to training (if you’re not sparring for example) then there are some good backpacks out there you can use. 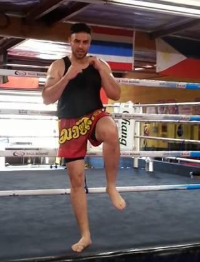 If you’re using a gym bag for Muay Thai, the bigger the better. Some days you may pack even more than this. I would recommend getting a bag of at least 60cm in length – especially if you take big equipment like a belly pad or kick pads. This may sound a bit sad, but I’m a big advocate of compartments in gym bags. I love to be organised, know where my stuff is, and most importantly… I like to keep my sweaty shorts and vests separate from my clean clothes. Gaining easy access to certain items it important to me too. For example, I keep my mouth guard in a zip compartment at the top of my bag, so I can quickly grab it when sparring starts. It’s a personal choice of course, but the thought of a bag with just one compartment to throw everything in gives me nightmares. The first thing you need is nice thick durable and adjustable straps for throwing the gym bag over your shoulder. Thin weak straps will not stay in place, and are likely to break over time if you are hauling lots of training gear around regularly. There’s nothing more uncomfortable than having your gym bag straps digging into your shoulder. Get a bag that has a padded strap cover to spread the weight and make those long journeys a bit more bearable. Grab handles are short handles on the top of gym bags that allow you pick them up and move them around with more control than the long shoulder straps. They make it easier to get them out of the car or hold them in packed spaces like public transport. Another feature that may sound a bit trivial, but you will really regret it if you don’t get a bag with grab handles. We all know that gym bags can stink after a while, which is a fact you can’t really avoid. However, you can reduce the pong slightly by getting a bag with some breathability. Look out for bags with mesh compartments and air holes that allow fresh air to get into your bag. Especially handy if (like me) you sometimes forget to empty your dirty gear after a couple of weeks away from training. Polyester is the most commonly used material for gym bags because it is tough, durable and waterproof. Nylon and canvas are also good materials, but canvas is not waterproof. The bottom of the bag should be made from a solid material to keep the shape and protect the bag and it’s contents from damage. I would recommend going with a known brand so that you get decent craftmanship and stitching on the bag – there’s nothing worse than having to buy a replacement bag because your original choice broke. In my opinion, it’s worth investing in a decent gym bag if you’re training Muay Thai, MMA or any other combat sport. You should expect to pay anywhere from £25 – £60 for a good quality bag of a decent size, with all the necessary features and compartments. Which is the best gym bag for your Muay Thai or MMA training? As you’ve seen, there are a surprising amount of variations in features of a gym bag, so have a good think about which are most important to you. If you carry a lot of gear, then size has to be the number one factor to consider, but you also need to ensure that you have a bag of a high quality with plenty of compartments and solid straps.